Well, "Random Reviews" has been used before so I hope no one minds if I use it again. I have an ongoing westerns marathon going so this thread will feature anything other than westerns that I watch unless I start yet another marathon..."Films of Steven Spielberg" anyone? Maybe later. Eccentric millionaire Thaddeus J. Banner (Gene Lockhart) adopts a feral cat caught stealing golf balls from the fairways of his country club. Others hate the cat for disrupting their games, but Banner admires its spirit: "I like things that fight back," he says, "Like artichokes!" Banner, a widower, tames the cat, names it Rhubarb and the two become inseparable. Several years later, when Banner dies, he surprises his business associates and only daughter, spoiled Myra (Elsie Holmes), by leaving nearly his entire estate - some $30 million - to Rhubarb. Eric Yeager (Ray Milland), press agent for Banner's lowly baseball team, is named the pussycat's guardian. From there the plot has several turns...the angry daughter of the millionaire tries to get rid of the cat, the cat becomes a good luck charm for the baseball team that goes on a winning streak, and bookies kidnap the cat and hold it during the big final game. 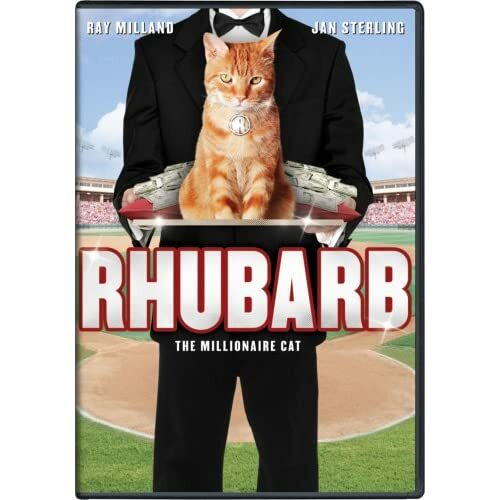 Some describe it as a screwball comedy...I'm not sure if that's accurate...it's about a decade or so too late for that type of film and doesn't have the quickly delivered dialogue that you might expect from Cary Grant and Katharine Hepburn but the stars of Rhubarb do very well and it's really a very funny film. It's got plenty of familiar stars and has lots of nice touches...at times it almost seems similar to "Miracle On 34th Street", especially regarding the rather fanciful court trial where the evil daughter tries to claim the real Rhubarb is dead and the guardian (Ray Milland) is only escorting around an imposter. If you want a good funny time and enjoy older films, you can do worse than Rhubarb. The movie is in black and white and the print on the DVD is excellent. There are no extras. Thanks Roger... sounds like a fun movie! I will have to add it to my always growing wish list. Marlin (a clown fish) is a widower who only has his son Nemo left of his family after a predator attack. Years later, on Nemo's first day of school, he's captured by a scuba diver and taken to live in a dentist office's fish tank. Marlin and his new friend Dory set off across the ocean to find Nemo, while Nemo and his tankmates scheme on how to get out of the tank before he becomes the dentist's niece's new pet. This is one of those movies that you hear so much about that you find yourself surprised at how long it's taken you to get around to watching it. This movie got glowing reviews when it came out and I always meant to watch it but never did...until now. The first thing I noticed about the movie was the stunning visuals. This movie looks absolutely gorgeous with unbelievably vibrant colors. The story moves along quickly (as most animated films are wont to do as they're usually 90 minutes or shorter as this one is). Sometimes you rack your brain for most of these animated movies trying to figure out who did the voices but I luckily didn't have to do that. I already knew that Ellen Degeneres did the voice of Dory (and she has the funniest dialogue in the movie) and I recognized right away the voice of Albert Brooks who provided Marlin's voice. 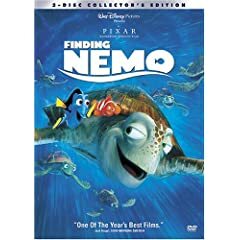 Nemo meets a lot of different kinds of sea creatures in this movie...I had to laugh at the very thought of a shark intervention. The shark's name is Bruce which I found funny since most people remember that that's what the tech people called the shark when they were making the movie Jaws. I found the jellyfish sequence rather exciting and it reached quite an exciting conclusion. I absolutely loved this movie and I'll probably find myself watching it again before too long. Maybe I'll watch it with the commentary sometime. They have a special visual commentary where, if you use that option, they'll actually interrupt the movie to take you on the scenes to see how some sequences came to be. As with many Disney special editions, this is a 2-disc set. One disc has the widescreen version and the other has the full-frame version and they divide the extras between the two discs. It's a movie I would heartily recommend. A volcanic eruption in the North Atlantic brings to the surface a 65-foot prehistor monster. Two treasure divers capture the creature and take him to London where he is put on display in a circus. Little do they realize that the creature is merely an infant and that the creature's mother (all 200-feet of her) will soon be on the way to reclaim its young. To me, this is a kind of American (or British, to be more accurate) take on the Japanese rubber suit monster movies (such as Godzilla) and they even go so far as to have a youngster who has a special feeling for the destructive creatures. This is a pretty decent film in that context with lots of destruction. This DVD came from VCI and the quality is okay but not pristine. It's a decent print though some night scenes are occasionally a bit hard to make out but overall a pleasant experience. Interestingly, there is no leading lady in this movie but apart from that I had a good time and the movie, at 76 minutes, moves quickly. Homer, Marge, Bart, Lisa and Maggie original debuted as super-short spots on the popular TRACEY ULLMAN SHOW in 1987--and proved so popular that they soon graduated to their own series, THE SIMPSON, on Fox. A mixture of zany action and pop culture satire, the show was a huge hit--and some twenty years later is still going strong. THE SIMPSONS MOVIE finds the family in their usual spate of comic chaos, including Grandpa's prophecy at church and Homer's acquisition of a pet pig. Unfortunately, when Homer dumps a silo full of pig crap into Lake Springfield, rendering it toxic, he attracts the attention of the EPA and makes Grandpa's prophecy come true. Is Springfield domed? Er, doomed? It's been awhile since I've seen a recent episode of The Simpsons...some people think the show has run its course, while others think it's still very entertaining. This movie is much the same way...some found it hilarious while others just thought it was more of the same. All I know is I laughed at it...quite a bit. In fact, rewatching the trailers just now, I laughed out loud again. If you enjoy The Simpsons as much as I do, I'm sure you'll have a good time so go ahead and run out and get it. Or, as President Arnold Schwarzenegger says in the movie, "I was elected to lead...not to read!" Mr. Incredible is a superhero; or he used to be, until a surge of lawsuits against superheroes submitted by the people they've saved forced the government to hide them in witness protection programs so they could lead normal, anonymous lives. Now known exclusively by his secret identity, Bob Parr, he lives with his wife Helen, formerly Elastigirl, and their three children Violet, Dash, and Jack Jack. He works as an insurance claims specialist, and he's fed up with his pushy boss and his immoral profession, but his wife's worked too hard to build a normal life for her family to abide his nostalgia for heroism. When Mr. 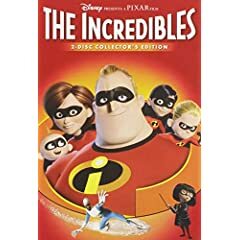 Incredible's offered the chance to play the role of hero again by a mysterious informant, he jumps at the opportunity, but when it turns out to be a trap set by an old nemesis he had a hand in corrupting, the whole family must reveal themselves to save Mr. Incredible and countless innocents. There are a lot of super-hero movies out there, both live-action and animated ones (most of the animated oones being for TV) but this computer-animated feature film takes a back seat to none of them. The artwork is amazing (some scenes have you wondering if it's really animated or live-action), it's funny and it's incredibly fast-moving. You'll be on the edge of your seat for pretty much the final half-hour of this film. I was...and I'd already seen the movie in a movie theater! Craig T. Nelson is the voice of Mr. Incredible and his wife, Elasti-Girl, is voiced by Holly Hunter. Holly is inspired casting...I could just sit and listen to her talk for hours. There actually was a real comic book character named Elasti-Girl but she didn't stretch like this one...she just grew in size until she was a giant. An interesting thing is that, except for their super-fast son (obviously inspired by The Flash), the other 3 main members of the family have the same powers as members of the Fantastic Four. There's super-strong Mr. Incredible (The Thing), the stretchable Elasti-Girl (Mr. Fantastic) and Violet who can become invisible and project force fields (Invisible Girl). Becoming invisible is one thing but force fields? The stealing factor is undeniable when you put those together. It's okay...it's still one of the most entertaining super-hero films I've ever seen. An original Mr. Incredible & Frozone film done in the style of Clutch Cargo (very limited animation with the characters using real llips to talk with). Sean Thornton (John Wayne) is an American who swears off boxing after accidentally killing an opponent. Returning to the Irish town of his birth, he finds happiness when he falls in love with the fiery Mary Kate (Maureen O'Hara). Though he is sorely tempted to fight her brother, the town bully (Victor McLaglen), Sean is determined not to raise his fists. Mary Kate and Sean wed but her brother refuses to pay the dowry. Sean would rather walk away than accept this challenge. Even when his new wife accuses him of cowardice, Sean stands firm. But when she boards a train to leave, he is finally ready to take matters into his own hands. The resulting fist fight erupts into the longest brawl ever filmed, followed by one of the most memorable reconciliations in motion picture history. A truly great movie, nominated for Best Picture and one that many people feel should have won. The film was shot in Ireland and has gorgeous cinematography. It's got drama, humor and, finally, action. I personally just love to hear the Irish accents this people talk with Ward Bond's style of speech a particular favorite. It has gentle moments to go along with the comedy and is definitely one of my all-time favorites. My one reservation in this edition is that the picture quality could be better. The focus is a bit soft and not nearly as sharp as you expect from a DVD. Of course, the movie is 57 years old now and perhaps this is as good as it can be...but perhaps not. If a new version (keeping Miss O'Hara's commentary) comes out with improved picture quality, I'll definitely add it to my list. I'd rate this a 10 but will have to take a point off due to the picture quality. 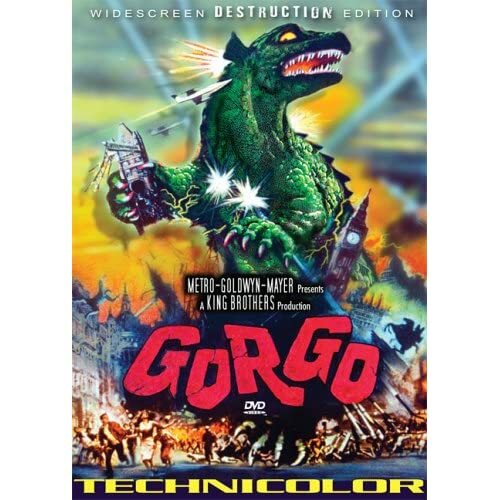 I think I did hear a rumor a few years back that a restoration of this film was in the offing so I hope that is true. I know several people who rate The Quiet Man as one of their favourites. I can't quite work out its charm, mainly because it passes me by! The fight is great, but up until then, I found it a struggle. Plot: Special-effects wunderkind and genre master Byron Haskin (The War of the Worlds, The Outer Limits) won a place in the hearts of fantasy-film lovers everywhere with this gorgeously designed journey into the unknown. When his spaceship crash-lands on the barren wastelands of Mars, U.S. astronaut Commander "Kit" Draper (Paul Mantee) must fight for survival, with a pet monkey seemingly his only companion. But is he alone? 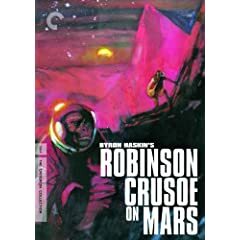 Shot in vast Techniscope and blazing Technicolor, Robinson Crusoe on Mars is an imaginative and beloved techni-marvel of classic science fiction. My Thoughts--This is definitely one of my favorite science fiction films of the 1960s...perhaps my favorite science fiction film of all of that decade. It deals with an astronaut's survival while marooned on the planet Mars and how he reacts to loneliness, then the sudden appearance of an escaped slaves and internplanetary spaceships who are after him and also use blasters from their spaceships to blast away at the planet's surfaces. The film is not overly futuristic but shows what we might have been capable of just a little bit into the future. It's a well-told story with fine photography and direction. This DVD is in widescreen format using an aspect ratio of 2.35:1. The DVD is from The Criterion Collection so it has a decent set of extras including an audio commentary with various members of the crew and its two key actors. This was recorded back in 1996 for, I believe, the laserdisc release of the film and it also includes some excerpts from a separate audio interview conducted in 1979 with the film's director, Byron Haskin. I would give the film and the DVD presentation two thumbs up...if I weren't afraid Roger Ebert might sue me! Thanks Roger... will add it to the list of movies I need to check out. well... it will definitely have to wait a while at that price! Who knows maybe it will see a re-release... bringing the price down. I would give the film and the DVD presentation two thumbs up...if I weren't afraid Roger Ebert might sue me! Wasn't one of those two famous thumbs Gene Siskel's...? Wow, thanks Roger, that was very insightful. I had no idea that the phrase was actually copyrighted! I disagree with Ebert though and renting is indeed a useful recommendation. Some films are not needed to be seen on the big screen and buying the DVD is not always granted... Example, as I just read that other thread, is The Hangover; I see no requirement to see that in the cinema, the beauty of las Vegas will not stun me more on the big screen.